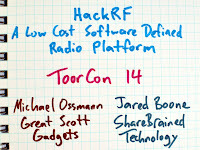 Jared Boone and I had the honor of presenting the keynote at ToorCon 14 over the weekend. In our talk, HackRF: A Low Cost Software Defined Radio Platform, we described our project to build a low cost, open source, wideband, portable Software Defined Radio peripheral. You can watch video of the presentation or download the slides. In addition to introducing HackRF to the ToorCon audience, we announced the HackRF beta test program. Thanks to DARPA's Cyber Fast Track (CFT) program, we are able to build a few hundred HackRF Jawbreakers and will distribute them to ToorCon attendees as soon as they are completed (hopefully around December). Each attendee of ToorCon 14 (and also the recent GNU Radio Conference) received a unique beta invitation code that can be redeemed for a Jawbreaker as soon as the hardware is ready to ship. Jared and I are very excited to be able to give away so many beta units. I'm not sure if any open source hardware project has had such a well funded beta program, but we think that giving away hardware in exchange for feedback (and hopefully some code) is a good trade in keeping with open source ideals. If you have an invitation code, look for an announcement on the HackRF page around December telling you how to redeem your code for a Jawbreaker. I know there are many of you out there who wish you had an invitation code, and I'm sorry that our funding for the beta program is finite! The redemption system, once it is live, will include a way to sign up for a waiting list if you do not have a code. There will probably be some extra beta units that we will distribute to as many on the waiting list as we can. My hope for the beta program is to validate HackRF Jawbreaker, resulting in a well-tested open source design that anyone can build or modify. 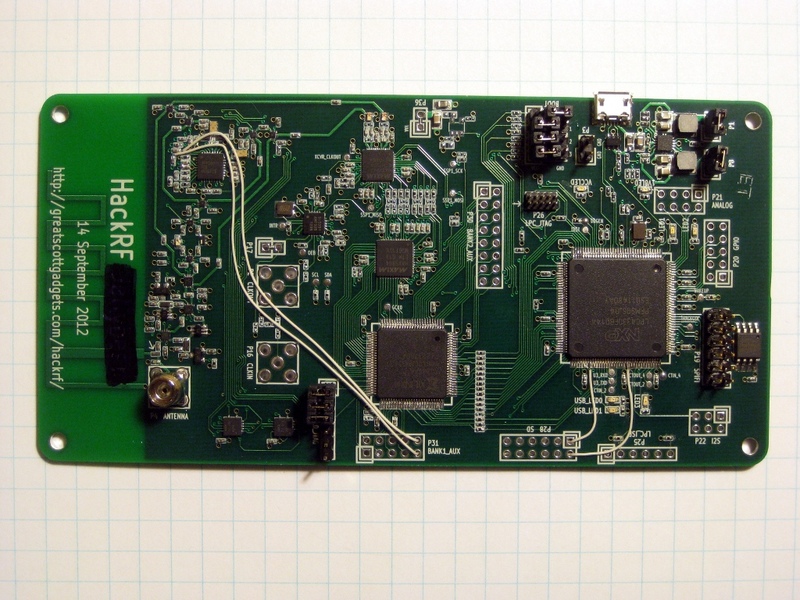 I also plan to release a commercial HackRF product (similar to Jawbreaker) that will be available for purchase after the beta. Thanks for all the kind words of support at ToorCon and since! After two and a half years of programming the IM-Me by soldering wires to the test points in the battery compartment, I finally got around to making a GoodFET/IM-Me spring pin adapter. I call it GIMME. Now I can install my spectrum analyzer application or any other firmware onto an IM-Me by simply removing the batteries and pressing the GIMME against the test points while the attached GoodFET does all the tricky stuff. GIMME is designed with KiCad. You can find the design files in the contrib directory of the GoodFET repo. 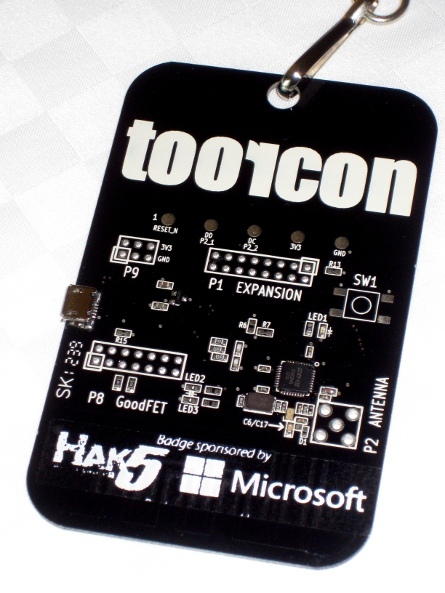 With ToorCon 14 coming up, I decided to have several GIMME PCBs made to give away. If you see me at the con this weekend and would like one, just ask. I also took it upon myself to make some GoodFET41 boards since Travis won't be around being his usual Johnny Appleseed of open source hardware. Plus, I will have a GIMME and GoodFET available to borrow, so bring that IM-Me that has been sitting in a drawer with factory firmware! Last week at the GNU Radio Conference I showed off Jawbreaker, the first unified HackRF board. I had assembled it just prior to leaving for the conference. It is completely built (including a couple of minor corrections), and I am about three-quarters of the way through validating the design. Jawbreaker integrates three separate designs into a single circuit board, making it smaller and easier to handle. Since my previous post, I tested multiple wideband front-end designs, eventually settling on one called Licorice. Jawbreaker is a combination of Licorice, Lemondrop, and Jellybean into a single USB-powered software radio transceiver peripheral designed to operate from 30 MHz to 6 GHz. This week I plan to finish validating the design and ordering PCBs of the next (likely final) revision. While I validate and revise the hardware design, Jared is hard at work on a USB driver for the LPC43xx microcontroller on the board. Prior to combining the three boards into Jawbreaker, I successfully tested both transmit and receive paths from the antenna all the way to the microcontroller, but the "last mile" USB communication from the microcontroller to the host computer was still incomplete. A puzzling feature you might have noticed on Jawbreaker is the integration of a PCB trace antenna for the 900 MHz band. 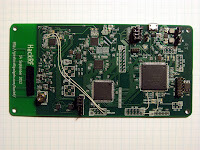 Although the board is designed for operation over a much wider frequency range, this antenna allows people to start experimenting with the board in the 900 MHz band immediately without any antennas, connectors, or anything at all other than a USB cable and computer. I want it to be easy for people to get started with the device because Jawbreaker is intended as the beta test platform for the HackRF project. We plan to assemble quite a few Jawbreakers and will distribute them to beta testers in the coming weeks. Beta hardware availability will be announced at ToorCon.